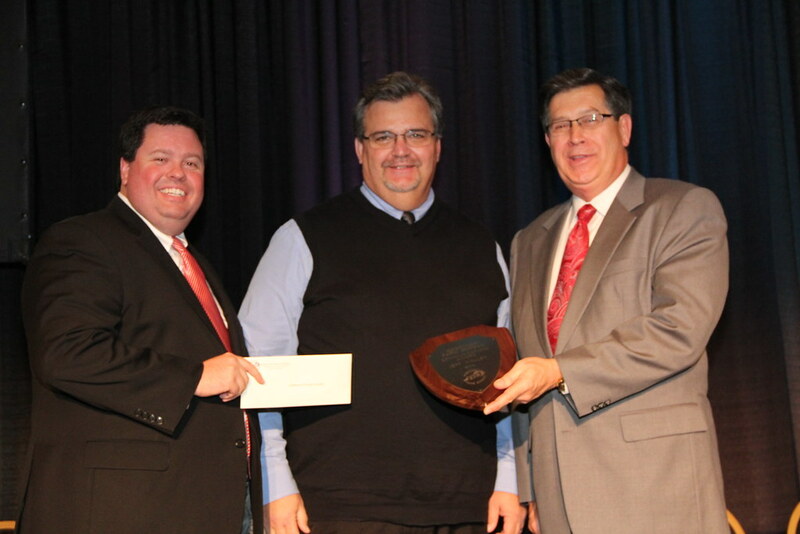 Louisville, KY (December 5, 2014) – Jeff Nalley, director of farm broadcasting with Cromwell AG Radio Network and freelance journalist for the Washington, D.C.-based Agri-Pulse, was named the winner of Kentucky Farm Bureau’s (KFB) 2014 Communications Award. He was recognized on December 4 during the general session of KFB’s annual meeting at the Galt House in Louisville. This is the fourth time Nalley has won the award. Daviess County Farm Bureau nominated Nalley for the commendable work he produces on behalf of Kentucky agriculture. Nalley, who also owns a 2-acre chrysanthemum farm in Utica, KY, has more than 30 years experience as a farm broadcaster and maintains a full daily schedule to report and promote agricultural news to radio markets across Kentucky, Indiana, Ohio, Illinois and Missouri. With just shy of 40 deadlines each day for the various radio stations he serves, Nalley’s voice is on the air and updating farmers seemingly at all times. His broadcasts include headline news, feature stories, financial markets and analysis, weather, and commodity reports and analysis. Most of his programming for the Cromwell AG Radio Network is completed in 90-second segments, but Nalley also produces three- and five-minute reports for extended coverage of the news and from major agricultural events. He also records a half-hour show each day that includes long format news, and is featured live on numerous morning shows in markets across the region. Nalley additionally serves as the voice for the Owensboro Regional Farmers Market, producing radio commercials and performing live broadcasts from the market throughout the season. Nalley, a voting member and past president of the National Association of Farm Broadcasting, has received numerous awards from farm organizations around Kentucky during his career. When he’s not busy reporting on location or from the broadcast booth, Nalley is often speaking at various agricultural and community meetings throughout the year.